Greece and the rest of Europe uses the Type C or Europlug. My biggest gripe with their sockets is that it’s set lower than normal, so your plug has to be right in the middle, and it has to be round so it can fit. I don’t know how else to describe it, so just check it out this photo on Airliners.net. Greece is at GMT +03:00, and is five hours behind the Philippines, so when you’re posting photos of how awesome your trip is, your friends and family back home are either slogging through another hellish work day or already getting ready for bed. Opening hours, siesta, Sundays – I’m not sure if it’s just because of the season, but opening hours in Greece seems to be much later than what we’re used to. We arrived in Chania at 6 am, and it was still very dark out. The sky started getting lighter around 7 am, and the Starbucks crew arrived around 8 am and promptly started cleaning and setting up shop. They opened their doors at 8:30 am. Some shops close early, and our host in Mykonos told us that some close for siesta and open again in the early evening. Most shops are closed on Sundays, but tourist attractions are open, so make sure to note that when you draft your itinerary. If you’re in Athens on a Sunday, head out to the Parliament building at 10:30 to watch the ceremonial changing of the guards. 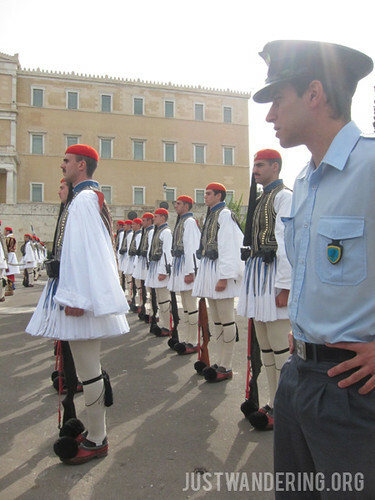 The Evzones that guard the Tomb of the Unknown Soldier in front of the Parliament in Syntagma square in Athens change every hour. You can have your photo taken with them, but only one person at a time, and you can’t touch them, make funny faces, or salute. If you want the full experience though, it’s best to watch on a Sunday, but be ready to battle with the crowds of tourists. We got there around 10:25, thinking we have more than enough time, but by 10:30, the commanding officer asked all the tourists to step back as he commanded the guards to switch places. As 11:00 neared, the crowd was asked to move further back. It turns out that instead of just the replacement two guards coming it, it’d be a whole parade. So if you want to have a front row view of the parade, make sure you’re at the island right in the middle of the road by 10:45, but you’d have to be quick to run back to the opposite side to get a good view of the guards. We got lucky when we stood towards the right, where the soldiers were. When the replacement Evzones stepped out, we got a clear view of the change right in the gap between soldiers. The best view, I think, would be from a corner room with a balcony at the Grand Bretagne Hotel. While you can see Athens spread out from the Acropolis, you can see Athens AND the Acropolis from Lykovittos Hill. You can reach the summit by taking a funicular from Kolonaki, but if you managed to walk from Syntagma Square to the funicular station, you can probably walk all the way up. Think twice about doing it in the summer. You’d have to climb lots of stairs if you’re walking up to the funicular station to go up Lykovittos Hill. 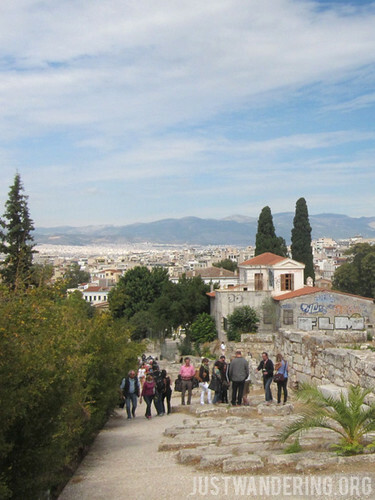 The ancient sites in Athens are centered around the area of the Acropolis. 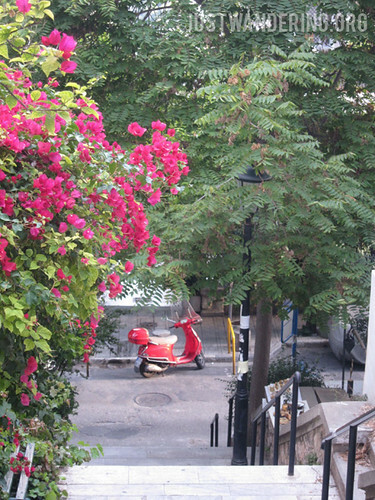 If they’re the main reason you’re in Greece, it’s better to spend a little more for accommodation in the Plaka area. 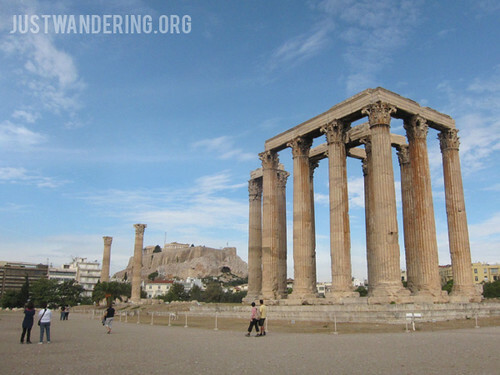 If you’re staying in Plaka, you can easily walk to the all the ancient sites in the Acropolis area, to the restaurants in Plaka, to the shops in Syntagma and Monastiraki, and even all the way to Kolonaki, if you’re determined enough. The Palace of Knossos in Crete and the Ancient site of Delos also require a fair bit of walking within the complex (or island, in the case of Delos), but to get there, you’d have to take a bus (Knossos), or a ferry (Delos). When you visit the Acropolis, they will give you an Acropolis Pass, which for €12 gives you access to seven ancient sites in Athens for up to four days upon purchase. This includes the Acropolis, the Ancient Agora, the Theatre of Dionysus, and the Temple of Zeus. Cobblestones abound in Oia in Santorini, so pick your footwear accordingly. If you’re going to be walking a lot, it’s best to do it with comfortable and sturdy footwear. Yes, your cute ballet flats are very comfy, but there never seem to be a shortage of cobblestone streets in Greece, especially around the tourist areas. Going up the Acropolis meant climbing stairs, stepping on huge rocks, and sometimes loose gravel. Santorini also requires some walking up and down stairs, so bear that in mind when you’re packing your favorite footwear. 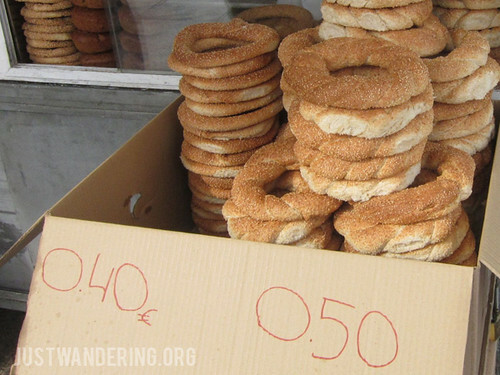 Greek pretzels sold in a kiosk at Syntagma square. They also sell donuts filled with Nutella! Gyros and souvlaki are usually the cheapest in the menu. In the touristy Acropolis, they sell these for €2-3, but outside you can get them for €1.80. Mains usually start at €7. One note when eating at restaurants, they would usually put bread on your table, and sometimes they might even put a bottle of water. Those are not complimentary, they will appear in your bill. In Crete, however, when you eat at Greek restaurants or tavernas, they give you dessert and a small bottle of raki (only during dinner), on the house. If you need to buy food and water, there are usually mini markets around tourist areas. They’re cheaper than the kiosks, but prices are much cheaper if you go to the big supermarkets. A 1.5 liter bottle of water at a mini market in Plaka in Athens costs €0.90. I was able to buy the same for €0.23 at a supermarket in Chania. If you’re traveling as a group or staying long, consider buying a six pack of water, because it’s going to be much cheaper. Factor in the cost of your transport to and from the supermarket if it’s worth the hassle just to save a couple of euros. You can also ask where the nearest bakery is and stock up on bread and pastries to eat on the go. They usually have sandwiches that are ready to eat (or for the panini press). They can look daunting at first, but try to figure out the corresponding letters in Latin script. It’s fun. Going by sea is the way to travel around the Greek islands. Ferries are huge and quite luxurious, I regret not booking more trips with them. Fast ferries are okay, but since they’re smaller, you can really feel the movement of the ship. It’s especially rough in the seas around Mykonos for some reason. Pack your motion sickness pills. When going to Delos, opt to sit in the upper deck. 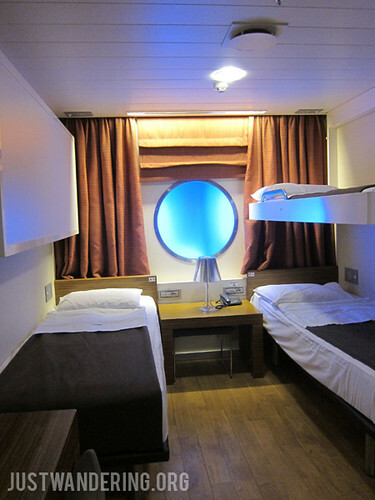 It can feel quite stifling inside the cabin. Food and drinks sold in the fast ferries are, as expected, quite expensive. Meals onboard Anek lines are surprisingly reasonable. I don’t know if it’s the same during the summer or winter, but when we went (October, autumn), the trains and buses did not have air conditioning. In Athens, the train ticket is flat rate €1.40 for one ride. In Santorini, bus fares rage from €1.60 to €2.20. The airport train in Athens has airconditioning though. If you’re traveling as a group, buy the tickets together, instead of individually, as there is a discount for 2 and 3 passengers. The fare is €8 flat rate to the airport. We only took the taxi twice, and both times, we were charge a flat rate. In Chania, it cost us €10 from Souda port to the center of Chania’s old town, while in Heraklion, it cost us €6 from the bus station to our hotel within the city center. There is a currency exchange booth right beside the baggage carousels at the airport in Athens, but the rate is not as good, and they also charge a commission on top of that. If you need euros, either change a small bill, or just use the ATM. One thing I like about Greek shop keepers is that they are not hard sell. They approach you to ask if you need anything, but once you say no, they retreat and don’t approach you again until you ask them. The touts waiting at the port in Santorini can be overwhelming, specially after the laid back people Athens and Crete, but just say no and they will stop. They have wifi everywhere, even the public squares. All of the places we stayed at has wifi, lots of cafe and restaurant we ate at had wifi too. If you plan to island hop in Greece, you might want to reserve a day in Athens to shop for souvenirs before flying out of the country. This gives you a chance to see what kind of souvenirs they’re selling and an idea of how much they cost. Magnets usually sell for €1, post cards from €0.15 to €1, depending where you’re buying and the quality of the postcard. Greek herbs are sold in souvenir shops for around €2-3 for a small pack (around 40 grams), but you can buy a 100 gram pack of oregano at the supermarket for €1.80. Postage for postcards is a flat €0.80 anywhere in the world. 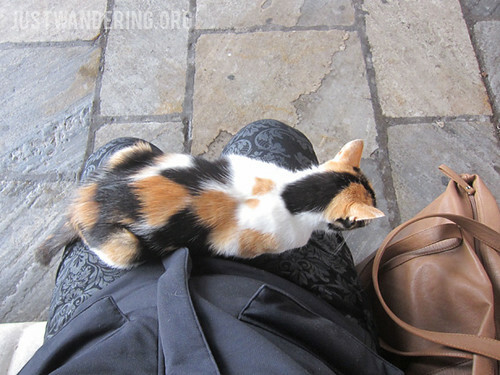 I just sat down on a bench and suddenly there was a cat on my lap. THEY’RE EVERYWHERE! AND THEY’RE SO FRIENDLY! AND SO FAT! Great list! I’m sure you enjoyed Greece. Lastly, I’ve read that the acropolis is smashed by tourists from cruise ships at about 10:30 AM. If this is true, is it better to see some other historical sites and come back to the Acropolis in the afternoon? Thanks for sharing. It is really very helpful.